The graphic above charts the logos of summer Olympic games from Paris 1924 to Rio 2016 and reads like a graphic design history timeline with historical design trends obvious in many of the logos. 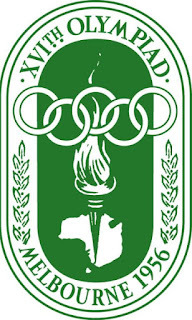 Recurring symbols in Olympic logos include the Olympic rings, the laurel leaf, Olympic flame and torch. Most of the logos adhere to the 5 principles of logo design but some, have been very controversial and highly critiqued, such as the London 2012 logo. Below, each of the logos are described and explained in more detail, with some very interesting facts revealed along the way. 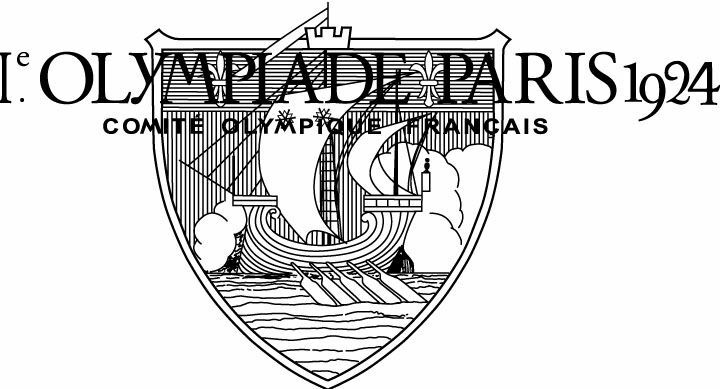 The Games of the VIII Olympiad returned to the city of Paris for a second time after the first in 1908. 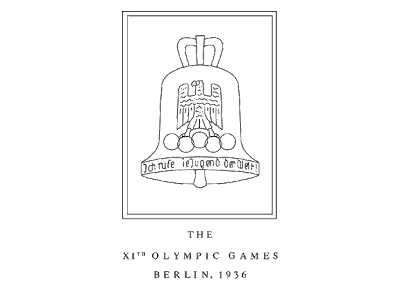 In contrast to the poster and signboard paintings used to represent the previous Olympics, the 1924 Olympics was the first to create an official logo. 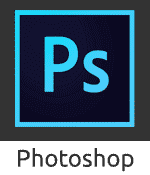 The logo depicts a wooden ship on the ocean in front of cloudy skies through a simple line drawing with serif lettering overlaid. 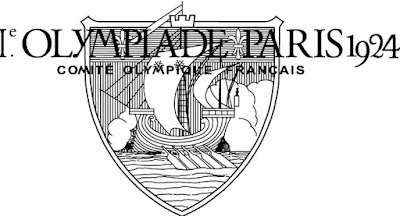 The meaning or relevance of the symbolism of the ship is unclear with no obvious connection to Paris, France or even sport. Los Angeles was the only city to make a bid to host the 1932 Olympics as the Great Depression hit the global economy. The 1932 Olympic logo was the first to use the Olympic rings in it , which was to become a feature in every Olympic logo which followed it. 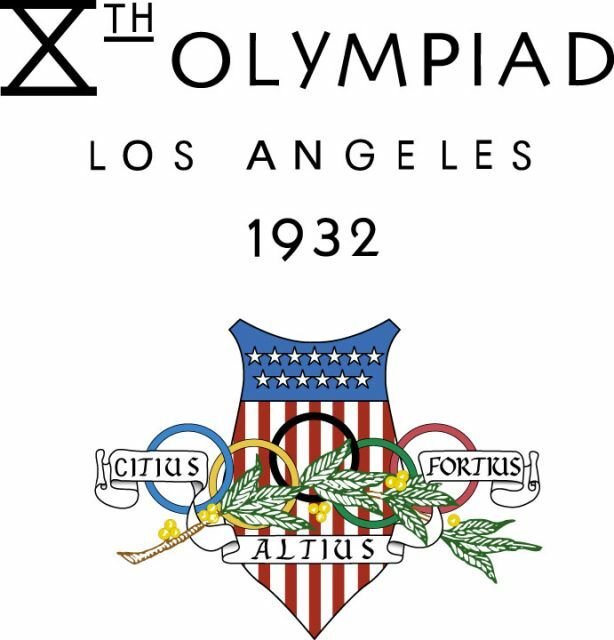 As well as the Olympic rings the logo also includes the stars and stripes of the American flag, the Olympic motto and a laurel leaf. Although quite obvious and blunt in its use of symbolism, the logo was at least appropriate and clear in it's purpose unlike the Paris 1924 logo. 1936 was a dark chapter for the Olympic Games as Adolf Hitler saw the event as an opportunity to promote his ideals of racial supremacy. The game s would be the last for 12 years due to the outbreak of World War II. In terms of the logo, the use of line art design, the absence of colours, and the symbolism eagle and bell give a sense of a rigid and stark environment. The Olympic rings are included but are not prominent and serve only as a platform for the eagle. In on way however, the logo was ahead of its time in it's simplicity as it was based entirely on a simple line graphic. After a 12-year break because of World War II, London was given the opportunity to host the event for the second time, the first being in 1908. 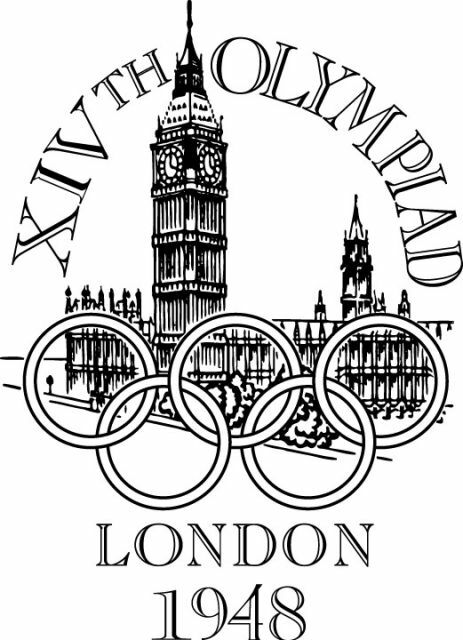 The logo displays the Palace of Westminster and "Big Ben" behind the Olympic rings, which return to prominence as an Olympic logo feature. While black and white still dominates the logo, the logo is the best designed thus far. There are subtle features such as white space between certain rings to ensure it's dominance, "Big Ben" juxtaposing through the semi-circular headline text to help draw the eye through all areas of the logo. 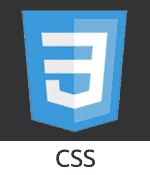 The semi-circular top text and straight line text at the bottom of the design also serve to frame the image. 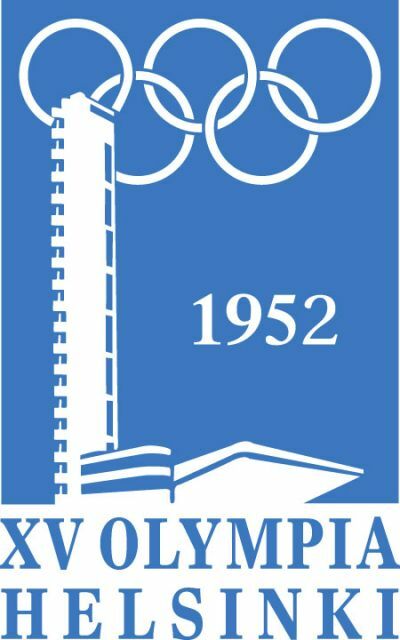 The Olympic Games of 1952 were held in Helsinki, Finland, the northernmost city at which a summer Olympic Games has ever been held. The 1952 Olympic logo design saw a return to the use of colour, albeit just a single one. It depicts the tower and stand of the Helsinki Olympic Stadium in front of the Olympic rings. The design is clean and minimal and is the fist Olympic logo to use negative space. After Helsinki being the northernmost city to host the Olympic Games, 4 years later Melbourne became the southernmost city to host the games. The 1956 Games were also the first to be staged in the Southern Hemisphere, as well as the first to be held outside Europe and North America. 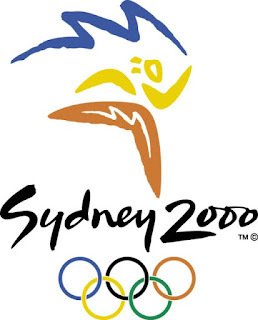 The logo was again designed using a single colour and depicted the Olympic rings and the Olympic flame, the first logo to do so, above the silhouette of Australia. We also see a return of the laurel leaf as a symbol after it's previous use in the 1932 logo. Like Helsinki, the Melbourne logo was generally seen as a success. After missing its first chance to host in 1908, the Olympic games finally arrived in the historic city of Rome in 1960. 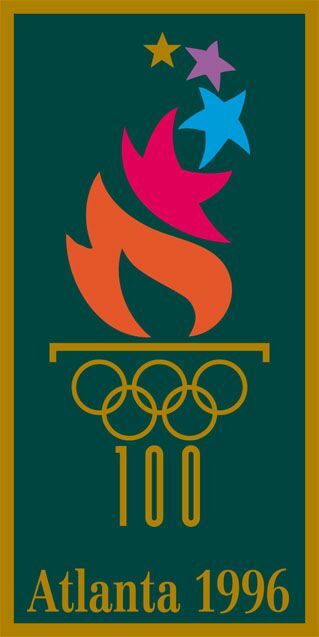 The Olympic logo of 1960 is very different to it's predecessors and was the first and only Olympic logo to include an animal. The wolf and children represent the ancient story of Romulus and Remus the twin brothers and main characters of Rome's foundation myth. The design has reverted back to black and white but is no flat like previous logos with a clear intent towards a 3 dimensional look. The logo is also the first to omit the name of the host city while also using Roman numerals instead of numbers to display the year. The 1964 Summer Games were the first Olympics held in Asia. Tokyo had initially been awarded the 1940 Summer Olympics, but it was rescinded after Japan invaded China. 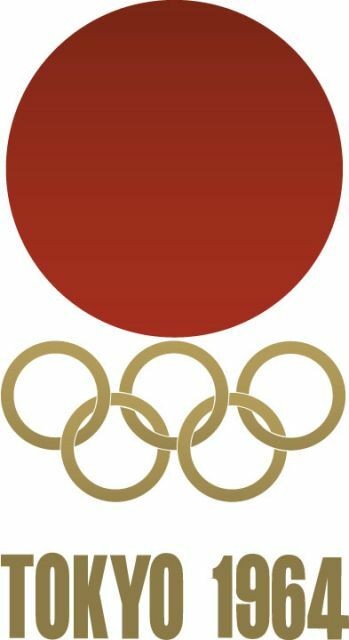 The logo for the 1964 summer Olympics depicts the red circle of Japan’s flag, signifying the sun, which sits atop the Olympics rings. It is a beautiful logo utilising minimal symbols and very effective graphical design. The red circle is not only the symbol of the country, but is also a great focal point with the use of subtle gradients in the red circle and the Olympic rings preventing it from looking too plain, flat or boring. The 1968 Summer Olympic Games was the first Olympic Games to be staged in Latin America and the first in a Spanish-speaking country. It was also the first Games to be held in a developing country. The design by Pedro Ramirez Vazquez, Eduardo Terrazas, and Lance Wyman is said to be inspired by the patterns of the Huichole Indians and simply depicts the city, year and the five Olympic rings with the year. 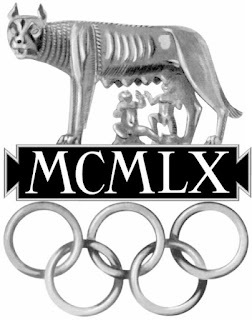 Although if you look closely you can see the XI as a roman numeral 6 and the CO being used to represent a sideways 8, together making up 68, the year of the games. A different orientation as well as the lack of a graphic sets this logo apart but the placement of the Olympic rings above the year is very questionable. In general, not a good logo. The 1972 Summer Olympics Games in Munich, Germany mindful of its connection to the Nazi regime, was eager to use the games to present a new, democratic and optimistic Germany to the world, as shown by the Games’ official motto, “Die Heiteren Spiele”, or “The Cheerful Games”. The logo was designed by Otl Aicher, and depicts a blue solar logo which re referred to as the “Bright Sun”. This design recalls previous Olympic logo designs. 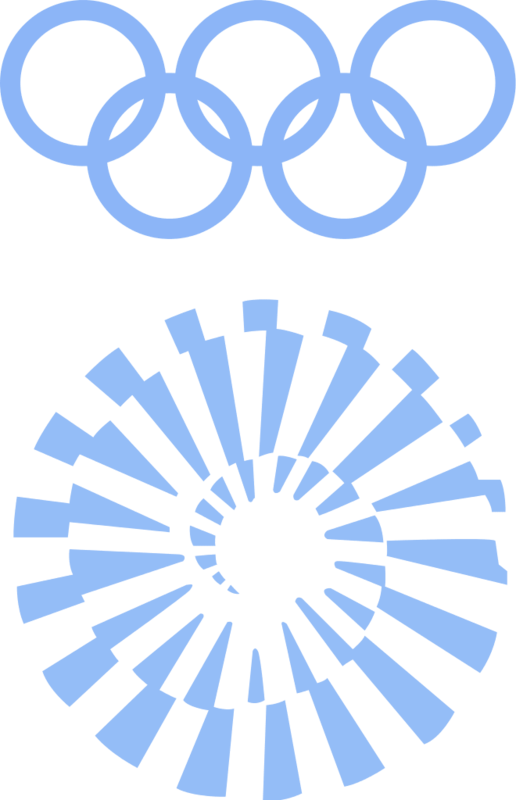 Blue reappears as the main colour as it did in the 1928 Amsterdam and Helsinki 1952 Olympics, while there is also is a very similar approach in layout to the 1964 Tokyo design. 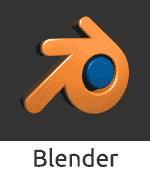 The spiral shape utilised in the logo has nice dimensions and visual movement. 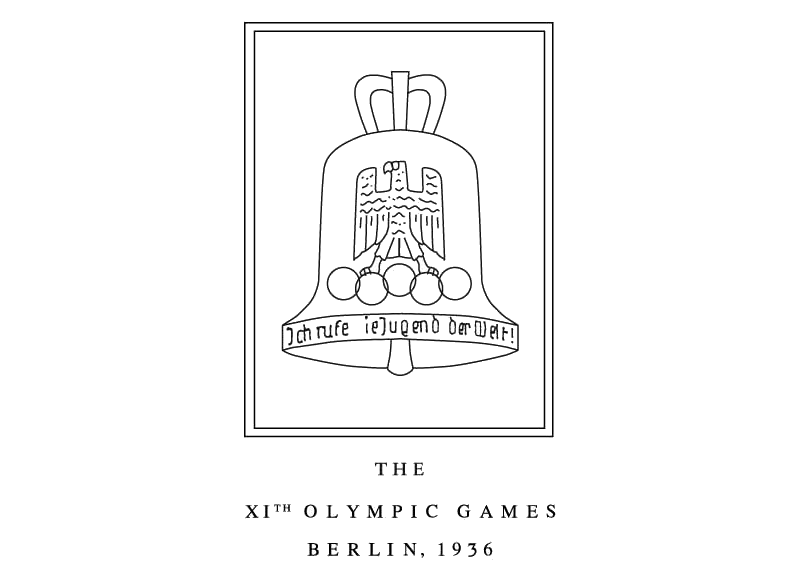 The full identity of the 1972 Summer Olympics has remained an iconic example of outstanding graphic design. The Olympic games of 1972 took place in Montreal, Canada. Most sovereign African nations, and a few other, boycotted the Montreal Games when the International Olympic Committee would not support the banning from competition of those countries whose athletes had participated in sporting events in South Africa during apartheid. 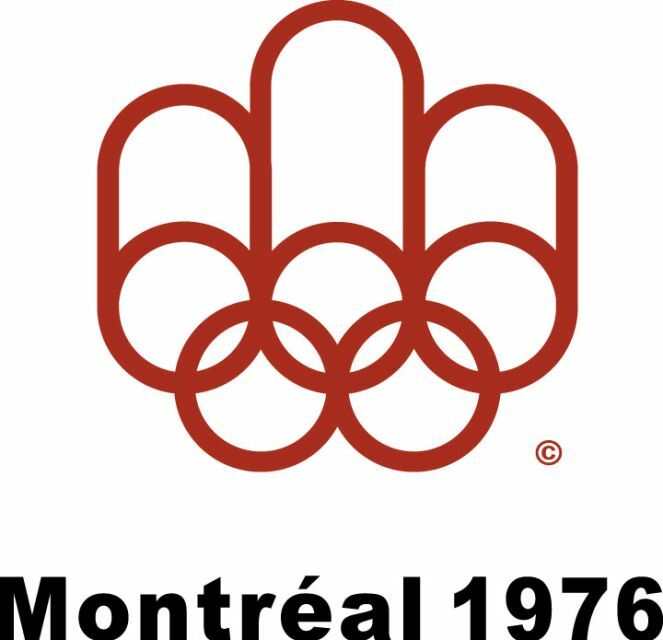 The official logo of the Montreal Games was designed by Yvon Laroche, Pierre-Yves Pelletier, Guy St-Arnaud and George Huel and much like its predecessor in Munich, is characterised by a minimalist look and feel. 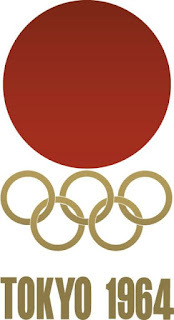 This Olympic logo features another strong design. The use of the letter “M” for Montreal on top of the 5 Olympic rings with everything appearing woven together. 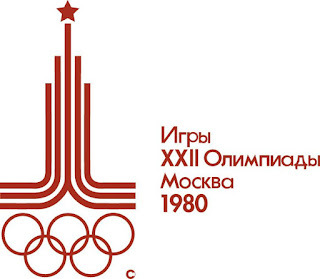 The 1980 Olympic Games were the first held in a communist country. The games were boycotted by 65 nations because of the Soviet war in Afghanistan. This, in turn, prompted the Soviet-led boycott of the 1984 Summer Olympics. 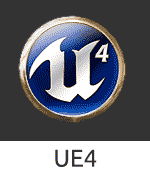 This logo bears some similarities with it's predecessor with a linear style featuring red as the predominant colour. The star, atop a six line tower, is a domino symbol which is designed to represent Moscow. As well as a tower, the lines can be seen to represent the lanes of a running track. The logo was not well received however with“Misha”, the official mascot designed by Victor Chizhikov, becoming more popular than the actual logo. 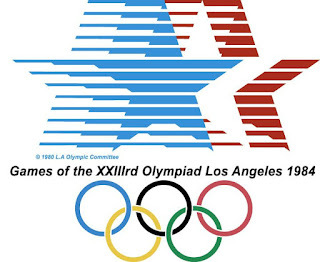 The 1984 Olympic Games was hosted in Los Angeles, a second time for the city after the previous games in 1932. 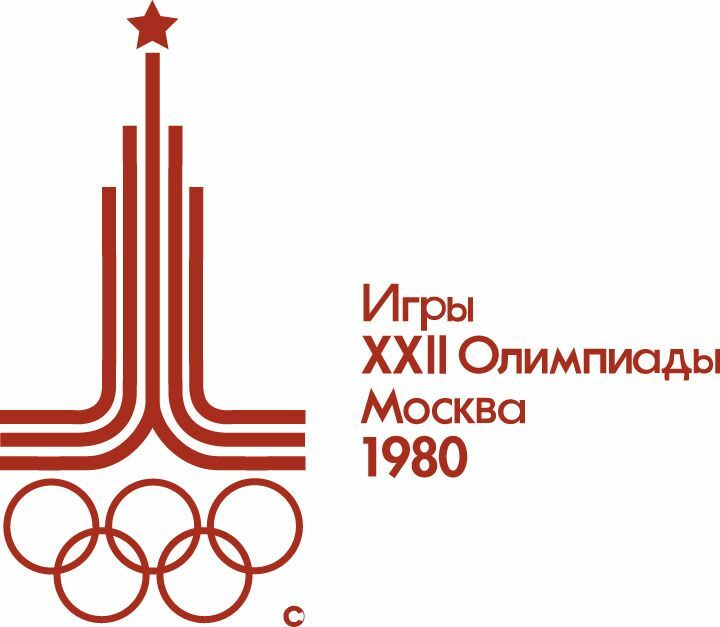 In response to the American-led boycott of the 1980 Olympics in Moscow, 14 Eastern Bloc countries decided to boycott the games in Los Angeles. This logo again features a version of the american flag as was done in the logo from 1932. The placement of the United States flag in the logo is very patriotic but also a little obvious and simplistic. The 1988 Olympic Games took place in Seoul, South Korea. North Korea, and its allies, Albania, Cuba, Madagascar, and Seychelles boycotted the games but larger boycotts, as seen in the previous three Summer Olympics, were avoided. 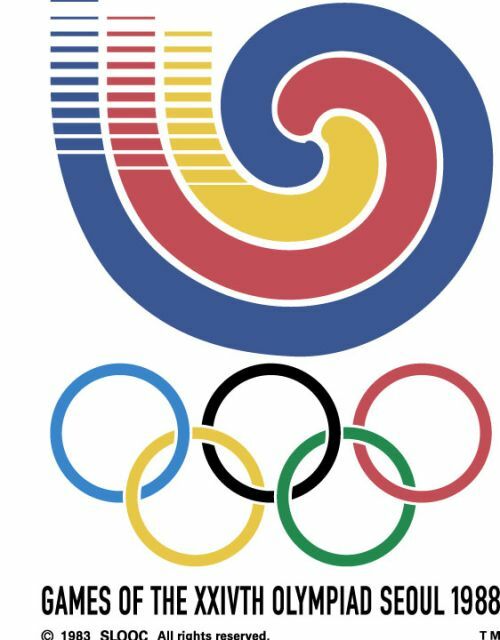 In the logo the placement and size of the Olympic rings are similar to the ones utilised in the 1984 Los Angeles games but the abstract format of swirls is in contrast to the straight edges of the 1984 logo. There is a sense of movement incorporated into both logos however which embraces the athleticism and dynamism of the Olympics. The 1992 Olympic Games in Spain were the first to be unaffected by boycotts since 1972. South Africa was allowed to compete in the Olympic Games for the first time since the 1960 Summer Olympics due to its apartheid policy. A reunified Germany sent a single unified team for the first time since 1964 to the games while a dissolved USSR and a separated Yugoslavia also sent their individual teams. The 1992 Barcelona logo continues the template of the previous years: keeping the rings in the lower part and a graphic or motif above. The abstract forms are reminiscent in style of brush strokes, perhaps referencing Spain's history of producing world renowned painters. The shapes themselves could represent a gymnast, runner, jumper or even a trace of Spanish bullfighting which would nicely reflect the host country. In 1996, the Olympic Games was celebrating it's 100th anniversary back in the United States in the city of Atlanta. The logo depicts the Olympic flame, which blows from a cauldron created by the Olympic rings on a column formed by the number 100. The transition of the flames into the stars, representing America, is smoothly done and is more subtle and aesthetic than the previous American symbols of the 1932 and 1984 logos. One of the very best Olympic logos in history. The 2000 Sydney Olympic Games known as the Millennium Olympic Games was the second time the event was held in Australia, the first being in 1956 in Melbourne. Overall, the logo depicts a runner holding a flag but included in this vivid logo design are references to the cultural heritage of the Aborigines through it's style and the incorporation of boomerangs (arms and legs). The Sydney Opera House, which is the symbol of Sydney, is incorporated clearly in both the outline of the flag and the white line inside the shape of the legs. A very clever logo indeed. 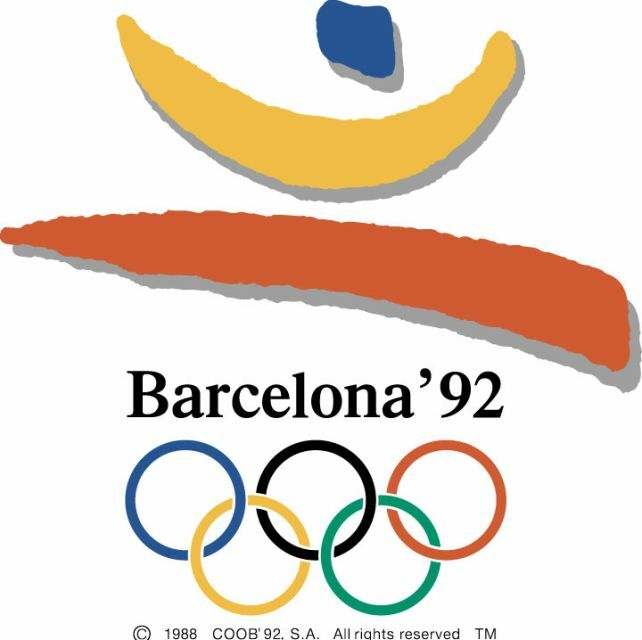 This Olympic logo design also uses a similar approach to the 1992 Barcelona games with the 3 main layers of shapes in blue, yellow and red/orange creating a human-like form. 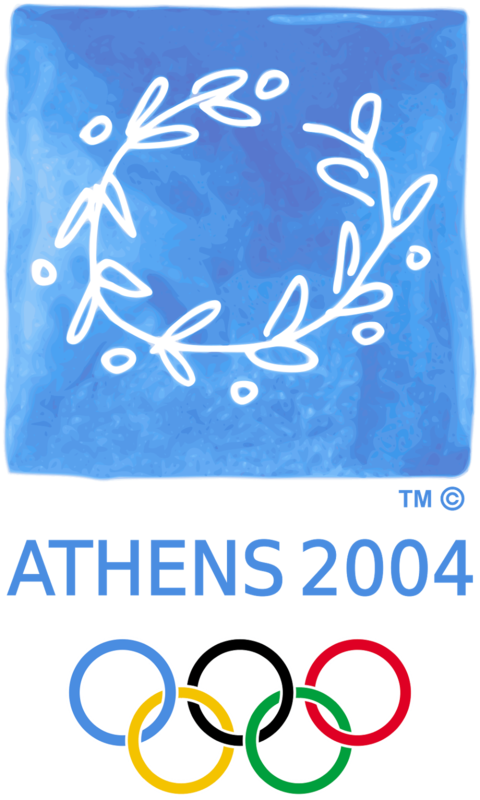 With the motto “Welcome Home,” the 2004 Olympic Games returned to its roots in Athens, Greece marking the return of the games to the city where it first began. 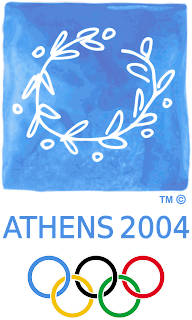 This highly effective logo design shows a white laurel wreath drawn on a light blue background with “Athens 2004” and the Olympic rings place below. The more modern take on the symbolic laurel wreath subtly creates almost child like drawings of athletic poses using the leaves (arms/legs), stem (body) and berries (head) of the laurel wreath to make up the human form. 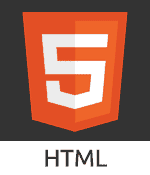 Unfortunately, the unnecessarily large trademark symbol draws some attention away from the design. 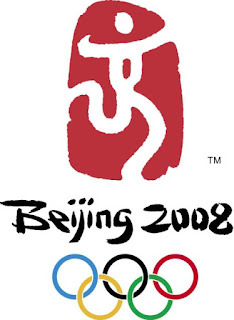 The 2008 Olympic Games was held in Beijing. The official motto for the 2008 Olympics was “One World, One Dream” (同一个世界 同一个梦想). The official logo of the Games, titled “Dancing Beijing”, refers to the host city by featuring a stylised calligraphic character jīng (京, meaning capital) which resembles a sportsman, runner, gymnast or a Chinese dancer. The font is also unique and very appropriate, as it has a resemblance to Chinese characters while the 'iji' in Beijing looks like a group of people with the 'e' almost like their shadow. 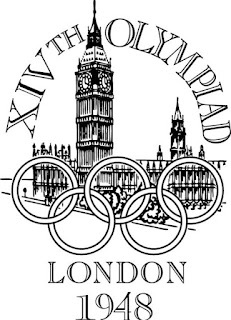 The 2012 Olympic Games returned to the city of London for the third time, previously hosting in 1908 and in 1948. The London 2012 Games also became the first at which every sport had female competitors. 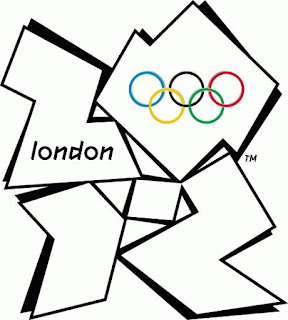 Despite controversial and negative reactions, this logo by Wolff Olins was chosen to represent London 2012. Abstract shapes are arranged to spell out 2012 with "London" and the Olympic rings been placed inside the shapes. The presentation of the numbers in the design is meant to appeal to today’s Internet generation, although I don't see how. The official London 2012 Olympic typeface was called Headline 2012 and it too suffered criticism. 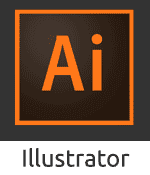 Overall this logo is not as strong as previous years and has been criticised at length in the design community. 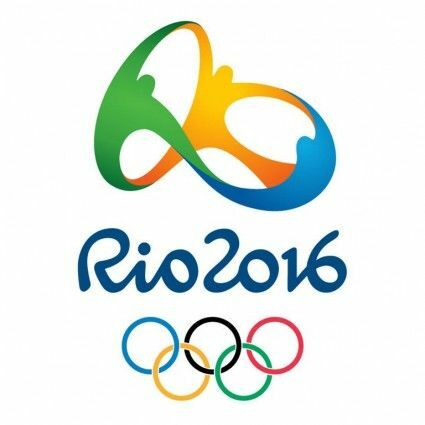 The 2016 Olympic Games will be held in Rio de Janeiro, Brazil. This is the first time the games will be hosted by a South American, Portuguese-speaking country and during the host country’s winter season. The official emblem for Rio 2016 was designed by the Brazilian agency Tatíl Design. It represents three figures, in yellow, green, and blue the colours of the Brazilian flag. The figures are joined at the arms in an embrace, with the overall shape reflecting that of outline of the Brazilian landmark the Sugarloaf Mountain. The logo was based on four concepts: contagious energy, harmonious diversity, exuberant nature, and Olympic spirit. However is has been courted by some controversy with some alleging this logo is plagiarised from the logo of US not-for-profit the Telluride Foundation. Tátil’s Fred Gelli put any likeness down to coincidence and noted that the broad concept of people embracing each other is not novel. This is very true and personally I really like this logo and don't feel the likeness is enough to cite plagiarism. If this review of Olympic logos has inspired you to get creative why not check out our article on the Logo Design Principles and then create a logo of your own.